Hope you all are well !! Got BIG news to share with you guys. 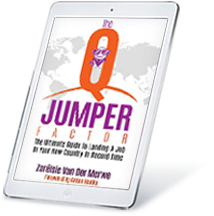 I first posted on the Job Seekers International – The Q Jumper Factor Method group page back in October when I got my first Skype interview with an potential employer in New Zealand. With the help of Zarélsie Van der Merwe , I learned better ways to approach potential employers and how to build a relationship with people on LinkedIn. After that interview I was asked by the potential employer to do an online assessment which I did and a week after that they requested a second Skype interview which went very well. And this morning I received an email that I got the job with the job offer and contract !! !😃 All this whilst still in South Africa. So people…it is possible !! I just want to thank Zarélsie again for all her assistance through this process and for all the things she has taught me. People…she knows what she is talking about !! Now it is work permit time.